When it comes to baseball cards, 2001 was a year ruled by a pair of rookies -- Ichiro Suzuki and Albert Pujols. 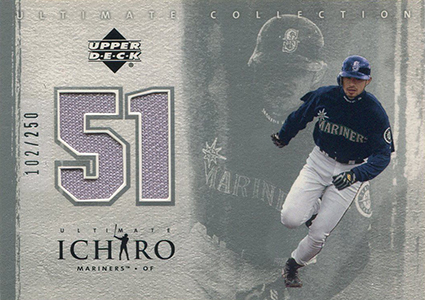 While Pujols had autographs and memorabilia cards with several different manufacturers, Ichiro went the exclusive route with Upper Deck. And if you're looking for any sort of quantity of Ichiro hits from his rookie year, 2001 Upper Deck Ultimate Collection Baseball is where you'll want to start your search. Not only does the set have one of two autographed Ichiro Suzuki rookie cards (the other is in 2001 SPx), but he has his own memorabilia-based insert set. Upper Deck has never a company to shy away from pushing the high-end envelope. 2001 Upper Deck Ultimate Collection Baseball continued that upward trend in both content and prices. A hit per pack is fairly common now, but that wasn't the case in 2001. 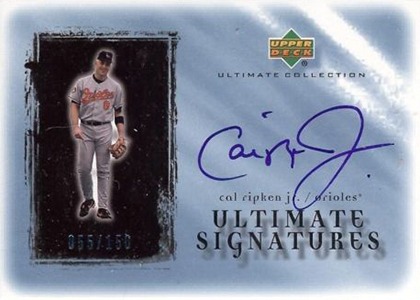 Each pack of 2001 Ultimate Collection has either a game-used memorabilia card or an autograph. 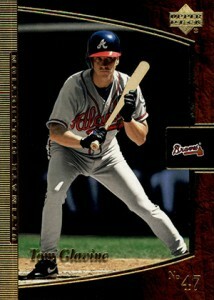 And if you look back to who was hot in the hobby at the time, the checklist is strong. 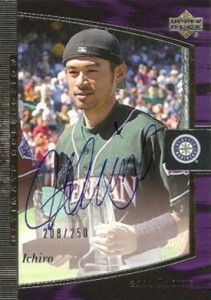 Ichiro Collection memorabilia cards are inserted one per box. These have a mix of embedded pieces including jerseys, batting gloves, bases, a fielding glove and balls. A handful also come with signatures. 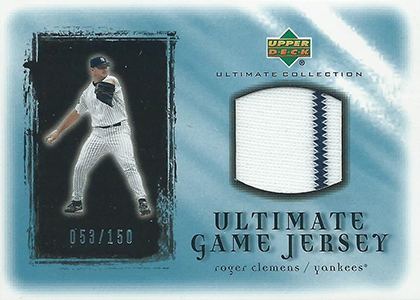 The rest of the memorabilia content in 2001 Upper Deck Ultimate Collection Baseball comes in the Game Jersey and Magic Numbers sets. Both sets have 30 cards. Base versions are numbered to 150. There are also multiple levels of parallels. Landing one per box, Signatures bring the majority of the product's autographs. The impressive list of signers includes Ken Griffey Jr, Kirby Puckett, Barry Bonds, Sandy Koufax and Cal Ripken Jr. The 2001 Upper Deck Ultimate Collection Baseball base set has 120 cards. The first 90 are veterans and aren't serial numbered. The final 30 are rookies, distributed in three tiers. The first ten are numbered to 1,000. Tier 2 rookies are limited to 750 copies each. The top players are part of Tier 3, which are numbered to 250. Ichiro, Mark Teixeira and Mark Prior each signed their rookie cards. Albert Pujols is also among the Tier 3 players but his rookies aren't signed. 2001 Upper Deck Ultimate Collection Baseball boxes come with four packs of four cards. 30 cards. #/150. 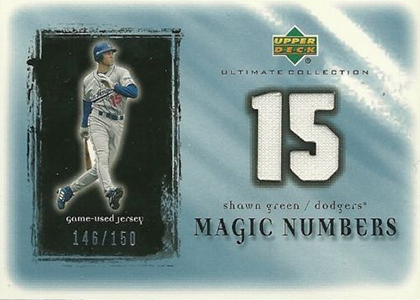 Combined with Magic Numbers Jerseys, inserted 1:2 packs. 30 cards. #/150. Combined with Game Jerseys, inserted 1:2 packs. 26 cards. #/150. Inserted 1:4 packs. Cards have different pieces of memorabilia and combinations. Different cards have different designs as well. Description by Ryan Cracknell says is all.